For better or worse I am a sucker for things Emily Dickinson. I love her poems so very much and she was such an interesting person — poet, gardener, baker of bread. 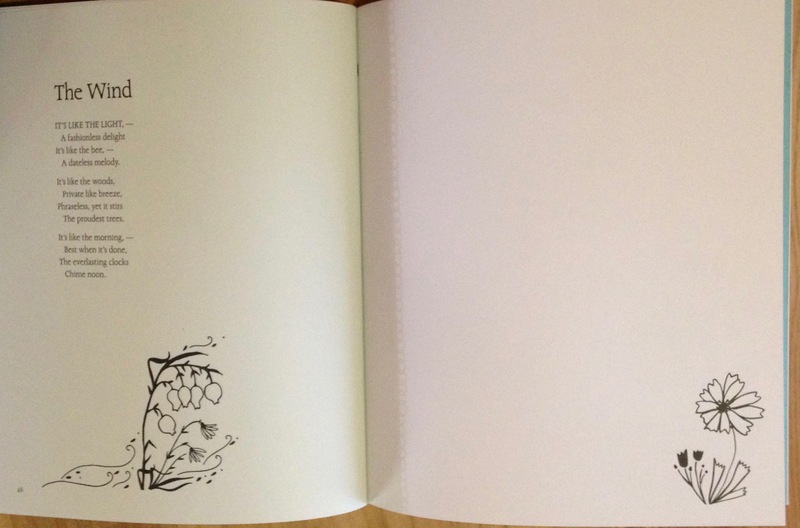 So when offered the chance to review The Illustrated Emily Dickinson Nature Sketchbook I could not say no. Unlike past times I couldn’t say no, I was not disappointed this time around. 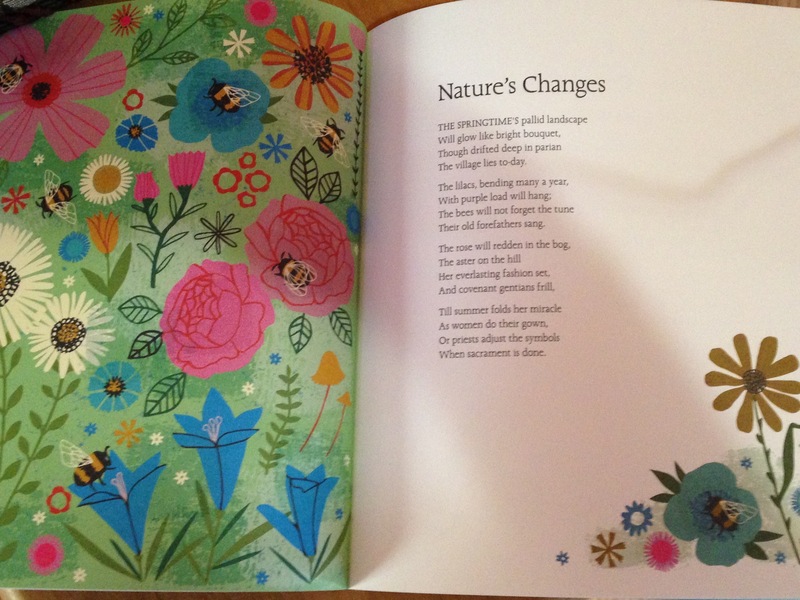 Just in time for National Poetry Month comes this gorgeous book that collects some of Dickinson’s poems about nature. But it isn’t just poetry. Illustrator Tara Lilly from Portland, Oregon, has created visually enchanting artwork to go along with the poems. Birds and flowers and mushrooms, butterflies and bees, I love the colors and just sat looking at them and smiling. Together with Dickinson’s poems, the art creates an uplifting and pleasant experience. But that is not all. 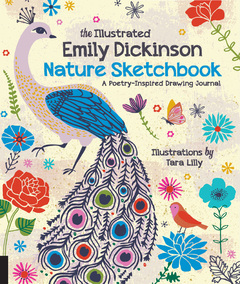 Perhaps inspired by the popularity of adult coloring books, The Illustrated Emily Dickinson is also a sketchbook. Most of the poems have blank pages opposite on which the reader is encouraged to create her own art while under the influence of Emily. And maybe you believe you cannot draw anything worthwhile. You don’t have to draw if you don’t want to. Maybe you just have fun swirling some colors around the page. Or, the pages are thick and could support collage if that takes you fancy. There is no need to fear your own personal creations will be somehow lacking especially up next to Lilly’s art. Her illustrations are of the simple sort that look so easy anyone can do them. And even though we all know that is a difficult thing to pull off, it is comforting to the art-challenged because you feel like you can make a go of it. In other words, the illustrations are not intimidating but heartening. You could also use the book as a writing journal or even use the poems as writing prompts and the sketch pages as your writing area. Even if you never find the confidence to add your own art, it is still a lovely book all on its own. It would also make a great gift for anyone with an artsy bent or who just plain loves Emily Dickinson. Yes, it would make a great book, an Easter gift for someone I know. And did you make your own art in response to any of her poems? This sounds enchanting. I just started nature journaling a little bit, but can’t draw. Am trying not to let that stop me! So glad to know about this book! Valorie, oh, this would be prefect for nature journaling! ohhh…this is I love!! Dickinson and paintings – perfection! cirtnecce, isn’t it pretty? It is very cheerful, great for spring when the weather is unpredictable! How very gorgeous Stefanie. I’m not surprised you couldn’t say no to the offer of that book. But still, no way would I let my pen near the book – I’d be terrified of sullying it. Looks like a nice poetry book. I like Emily Dickinson as well, but I am like whisperinggums–I would not be able to draw in the book–I would feel like my doodles would ruin it. As much as I want to partake in the coloring book craze, I find I am just not drawn (no pun intended) to them–sad as I broke down and bought one plus a box of colored pencils–which I have owned for probably six months now without even picking up….. But it is a fun idea! Danielle, oh you and WG! It would be really hard to ruin the book and your creativity might just surprise you! 🙂 Don’t feel bad about the coloring book, I have one and started coloring but haven’t even finished one picture. So many other things to do! I probably would not draw on the blank pages (although I might fill in the line drawings). However, I might use those photo corners and attach photographs of my garden (if I had a good one), or nature photos taken during walks, on the blank pages. Grad, oh what a great idea to attach nature or garden photos to the pages! Wow, I want this book! I adore ED and would probably use the sketch pages to write my reflections on the poems. Sarrah, ED is so wonderful, isn’t she? Such variety of subject and there truly is no one else like her. I love Emily, and this book looks so visually beautiful as well! Jenclair, I bet your craft self would make some beautiful Emily inspired art in these pages! I love Emily Dickinson too. This is a book I must get my hands on! Iliana, I can see crafty you doing some wonderful things with this book!